Trubisky was born in Mentor, Ohio. He attended Mentor High School where he played for the Cardinals football team. During his high school football career, he passed for 9,126 yards and 92 touchdowns and rushed for 1,559 career yards and 33 touchdowns. He was the recipient of the Ohio Mr. Football Award in 2012. Trubisky committed to the University of North Carolina at Chapel Hill to play college football under head coach Larry Fedora. Trubisky played in ten games as a backup to starter Marquise Williams in 2014. He made his collegiate debut in relief of Williams against the Liberty Flames in a 56–29 victory. In the game, he was 10-of-16 for 66 yards with one touchdown and one interception. He threw his first career touchdown to tight end Jack Tabb in the third quarter. He appeared in North Carolina's bowl game at the end of the season against the Rutgers Scarlet Knights. In the 2014 Quick Lane Bowl, he was 7-of-9 for 65 yards and a touchdown, which was a pass to receiver Kendrick Singleton, in the 40–21 loss to the Scarlet Knights. For his freshman season he completed 42-of-78 passes for 459 yards, five touchdowns, and four interceptions. As a sophomore, Trubisky again served as the backup to Williams, appearing in nine games in the 2015 season. He made his season debut against the North Carolina A&T Aggies. In the game, he was 5-of-7 for 37 yards and a touchdown. In addition, he had a 35-yard rushing touchdown in the 53–14 victory. He had a career day against the Delaware Fightin' Blue Hens on September 26. He was 17-of-20 for 312 yards and four touchdowns in the 41–14 victory. He did make an appearance in the ACC Championship Game against the Clemson Tigers on December 5. He completed his lone pass attempt for 16 yards. For the season, he completed 40-of-47 passes for 555 yards and six touchdowns and rushed 16 times for 101 yards and three touchdowns. As a junior, Trubisky took over as the starting quarterback in 2016. He started in all 13 games in the 2016 season. In the season-opening 33–24 loss to the Georgia Bulldogs, he was 24-of-40 for 156 yards. He added three rushes for seven yards and one touchdown. In the following week against the Illinois Fighting Illini, he had 265 passing yards and two touchdowns. In addition, he had nine rushes for 42 yards and two rushing touchdowns in the 48–23 victory. Two weeks later against the Pittsburgh Panthers, he had a career-day through the air. He was 35-of-46 for 453 yards and five touchdowns in the 37–36 victory. On November 5, against the Georgia Tech Yellow Jackets, he had his first career reception, which was for eight yards. In the 2016 Sun Bowl against the Stanford Cardinal, he was 23-of-39 for 280 yards, two touchdowns, and two interceptions in his final collegiate game, a 25–23 loss. He recorded 3,748 passing yards with 30 touchdowns and six interceptions in his junior season. As a result of his successful junior season, he was named a member of the third-team All-ACC. Trubisky decided to forego his senior season and declared for the 2017 NFL Draft on January 9, 2017, opting to give up his final year of college eligibility. During the 2017 preseason, Trubisky recorded the third-highest passer rating of the 29 quarterbacks with at least 50 passes with 106.2, along with three touchdowns and no interceptions. Despite his strong preseason, he was named the backup to Mike Glennon for the 2017 regular season. After the Bears started the season with a 1–3 record, head coach John Fox benched Glennon and Trubisky was named the starter for Week 5. Trubisky made his first regular season start on October 9, 2017, against the Minnesota Vikings, where he completed 12-of-25 passes for 128 yards, a touchdown, and an interception, as the Bears lost 20–17 on Monday Night Football. His first career touchdown was a 20-yard pass to tight end Zach Miller. In his next start, he completed 8-of-16 passes, including a touchdown and a critical completion in overtime that set up a game-winning field goal in a 27–24 win over the Baltimore Ravens. During Week 7 against the Carolina Panthers, Trubisky was limited to 107 passing yards, but with the defense forcing three turnovers and two defensive touchdowns, the Bears won by a score of 17–3. In Week 12, Trubisky completed 17 for 33 passes for 147 yards and two interceptions en route to a 31–3 loss against the Philadelphia Eagles. The following week, Trubisky completed 12-of-15 passes for 102 yards and a touchdown against the San Francisco 49ers, but a late field goal by Robbie Gould lifted the 49ers to a 15–14 victory. During Week 14, however, he completed 25-of-32 passes for 271 yards and a touchdown to seal a 33–7 blowout win over the Cincinnati Bengals, snapping a five-game losing streak as well as posting a 112.4 passer rating. In Week 15, he struggled against the Detroit Lions; despite finishing with 314 passing yards and a touchdown, he also threw three interceptions as the Bears lost 20–10. In the next game, a 20–3 victory over the Cleveland Browns, Trubisky threw for 193 yards; increasing his season passing yard total to 2,015, the most by a rookie in Bears history. In the regular season finale, a 23–10 loss to the Minnesota Vikings, he had 178 passing yards and no interceptions. Trubisky ended his rookie season with a 4–8 record in 12 starts, seven touchdown passes, and seven interceptions. He also ran for 248 yards, the most by a Bears quarterback since Kordell Stewart in 2003. Fox was fired after the 2017 season and was replaced by Kansas City Chiefs offensive coordinator Matt Nagy, who expressed an interest in working with Trubisky after the two met prior to the 2017 draft. General manager Ryan Pace made it an off-season priority to build the Bears' offense around Trubisky, the team signed wide receivers Allen Robinson and Taylor Gabriel and tight end Trey Burton over the 2018 off-season. Despite Trubisky having a slow start to the 2018 regular season in which he threw just two touchdown passes in the first three games, the Bears managed a 2–1 start through the first three weeks. In Week 4 against the Tampa Bay Buccaneers, he played one of the greatest games for a Bears quarterback in team history as he completed 19-of-26 passes for 354 yards, six touchdowns (including five in the first half), and a passer rating of 154.7 as Chicago won by a score of 48–10; the six touchdowns were one short of the Bears franchise record set by Sid Luckman in 1943. Trubisky became the first Bears quarterback to throw five touchdowns in a half since Johnny Lujack in 1949, and he was the second player in NFL history to have five different players catch a touchdown pass in a game since Aaron Rodgers of the 2014 Green Bay Packers against the Bears. He was named the FedEx Air Player of the Week for his performance. After a Week 5 bye, in Week 6 against the Miami Dolphins, Trubisky threw for 316 yards, three touchdowns, and one interception in the 31–28 overtime loss. In Week 7, in a loss to the New England Patriots that saw his potential game-tying Hail Mary pass to Kevin White be caught one yard short of the end zone, Trubisky threw for 333 yards, two touchdowns, and two interceptions, while also rushing for 81 yards and a touchdown. On the touchdown run, from the Patriots' eight-yard line, he faced pressure that forced him to retreat horizontally across the field before running forward for the score; while it is officially an eight-yard touchdown run, he ran a distance of 71.91 yards on the play. The following week, he hit Tarik Cohen for a 70-yard touchdown in the first quarter, ending the day with 220 yards in the win over the New York Jets. In Week 9, against the Buffalo Bills, his output was low but the Bears victory was assisted with four takeaways and two defensive touchdowns. In Week 10 against the Detroit Lions, Trubisky threw for 355 yards and three touchdowns, and rushed for 18 yards and a touchdown, in their 34–22 victory against the division rival. His performance again earned him NFC Offensive Player of the Week. In a prime time victory over the Minnesota Vikings during Week 11, Trubisky threw one touchdown and two interceptions for 165 yards, but suffered a shoulder injury delivered by Vikings' safety Harrison Smith on a late hit, which caused him to miss the Bears' next two games. Trubisky made his return in Week 14 against the Los Angeles Rams and threw for 110 yards, one touchdown, and three interceptions. His touchdown pass was a two-yard pass to offensive lineman Bradley Sowell. Despite his struggles, the Bears defense made four interceptions off Rams quarterback Jared Goff and won by a score of 15–6. In Week 15, Trubisky threw for 235 yards and two touchdowns in a 24–17 win over the Green Bay Packers. The win also clinched the NFC North division for the Bears for the first time since 2010. During the Week 16 win over the San Francisco 49ers, Trubisky completed 25 of 29 passes for 246 yards and a touchdown for a completion percentage of 86.2, the highest by a Bears quarterback with at least 20 passes since 1950. He also became the sixth quarterback in Bears history to record 3,000 passing yards in a season. After 163 yards in the season finale victory over the Minnesota Vikings, he ended the regular season with 3,223 passing yards, 24 touchdowns, and 12 interceptions; he also rushed for 421 yards (fifth among quarterbacks) and three touchdowns. He tied the team record for most 300-passing-yard games in a season with four, while also setting a franchise-high of games with a passer rating higher than 120 as he had four. He received an overall grade of 63.6 from Pro Football Focus in 2018, which ranked as the 33rd highest grade among all qualifying quarterbacks. In the Wild Card Round against the Philadelphia Eagles, Trubisky rebounded from nearly throwing two interceptions in the second quarter to completing 13 of 20 passes for 198 yards and a touchdown to Robinson in the second half. On the Bears' final drive of the game, with 48 seconds remaining and his team trailing 16–15, Trubisky led a 33-yard drive that featured a 25-yard pass to Robinson. However, Cody Parkey's game-winning field goal failed and resulted in a Chicago defeat. Trubisky ended his playoff debut having completed 26 of 43 passes for 303 yards, one touchdown, and a passer rating of 89.6; the yards and completions set franchise postseason records, while Trubisky became the youngest Bears quarterback to throw a touchdown pass in the playoffs since Doug Flutie in 1986. In December, Trubisky was named an alternate to the 2019 Pro Bowl. On January 21, 2019, he was officially declared a Pro Bowl participant in place of Super Bowl LIII-bound Goff. He became the first Bears quarterback since Jim McMahon in 1986 to be named to the Pro Bowl. Trubisky is nicknamed "Mr. Biscuit" as a play on his name. ^ "Mentor's Mitch Trubisky named Mr. Football". Cleveland 19 News. Retrieved January 19, 2018. ^ Carter, Andrew (August 8, 2016). "UNC's Mitch Trubisky finally the starting quarterback". The News & Observer. Retrieved August 3, 2017. ^ "Why Mitch Trubisky didn't start until junior year at UNC". newsobserver. Retrieved December 10, 2018. ^ "Liberty at North Carolina Box Score, August 30, 2014". Sports Reference. Retrieved August 3, 2017. ^ "Quick Lane Bowl - Rutgers vs North Carolina Box Score, December 26, 2014". Sports Reference. Retrieved August 3, 2017. ^ "Mitch Trubisky 2014 Game Log". Sports Reference. Retrieved August 3, 2017. ^ "North Carolina A&T at North Carolina Box Score, September 12, 2015". Sports Reference. Retrieved August 3, 2017. ^ "Delaware at North Carolina Box Score, September 26, 2015". Sports Reference. Retrieved August 3, 2017. ^ "North Carolina vs Clemson Box Score, December 5, 2015". Sports Reference. Retrieved August 3, 2017. ^ "Mitch Trubisky 2015 Game Log". Sports Reference. Retrieved August 3, 2017. ^ "Georgia vs North Carolina Box Score, September 3, 2016". Sports Reference. Retrieved August 3, 2017. ^ "North Carolina at Illinois Box Score, September 10, 2016". Sports Reference. Retrieved August 3, 2017. ^ "Pitt at North Carolina Box Score, September 24, 2016". Sports Reference. Retrieved August 3, 2017. ^ "Georgia Tech at North Carolina Box Score, November 5, 2016". Sports Reference. Retrieved August 3, 2017. ^ "Sun Bowl - Stanford vs North Carolina Box Score, December 30, 2016". Sports Reference. Retrieved August 3, 2017. ^ "Mitch Trubisky 2016 Game Log". Sports Reference. Retrieved August 3, 2017. ^ "Trubisky tabbed as starting QB for North Carolina". ESPN.com. ^ "Trubisky time finally arrives at UNC". News Observer. ^ Podolski, Mark (April 22, 2016). "College football: Mentor graduate Mitch Trubisky named North Carolina's starting quarterback". The News-Herald. Willoughby, Ohio. Retrieved May 23, 2018. ^ "Mitch Trubisky Career Game Log". Sports Reference. Retrieved August 3, 2017. ^ a b "Combine Player Profiles – Mitchell Trubisky". National Football League. Retrieved April 27, 2017. ^ "2017 NFL Draft Listing". Retrieved January 19, 2018. ^ Eurich, Matt. "Mitch Trubisky praised by NFL scout for preseason play". 24/7 Sports. Retrieved September 2, 2017. ^ "Minnesota Vikings at Chicago Bears - October 9th, 2017". Pro-Football-Reference.com. Retrieved November 5, 2017. ^ Dickerson, Jeff. "Bears' Mitchell Trubisky breaks rookie QB curse in Baltimore". ESPN.com. Retrieved October 16, 2017. ^ "Carolina Panthers at Chicago Bears - October 22nd, 2017". Pro-Football-Reference.com. Retrieved November 14, 2017. ^ a b "Mitchell Trubisky - Game Logs: NFL.com". NFL.com. Retrieved November 28, 2017. ^ "Chicago Bears at Cincinnati Bengals - December 10th, 2017". Pro-Football-Reference.com. Retrieved January 19, 2018. ^ "Chicago Bears at Detroit Lions - December 16th, 2017". Pro-Football-Reference.com. Retrieved January 19, 2018. ^ "Cleveland Browns at Chicago Bears - December 24th, 2017". Pro-Football-Reference.com. Retrieved March 20, 2018. ^ "Chicago Bears at Minnesota Vikings - December 31st, 2017". Pro-Football-Reference.com. Retrieved March 20, 2018. ^ Palmer, James (August 23, 2018). "Matt Nagy-Mitch Trubisky bond pre-dates Chicago Bears days". National Football League. Retrieved October 1, 2018. ^ Neveau, James (September 30, 2018). "Chicago Bears QB Mitchell Trubisky Has Record-Setting Day at Soldier Field". WMAQ-TV. Retrieved October 1, 2018. ^ "Among 2-1 teams, Bears look playoff-bound, Bucs do not". NFL.com. Retrieved December 10, 2018. ^ Silverstein, Jack M. (September 30, 2018). "Mitch Trubisky's 6-touchdown day was historic". Windy City Gridiron. Retrieved December 10, 2018. ^ Finley, Patrick (September 30, 2018). "After Mitch Trubisky went 6 times 6, he hopes 'this is where it all started'". Chicago Sun-Times. Retrieved September 30, 2018. ^ Eurich, Matt (October 4, 2018). "Mitch Trubisky wins FedEx Air Player of the Week". 247Sports.com. Retrieved October 5, 2018. ^ Wine, Steven. "Mitchell Trubisky throws for three touchdowns but Bears lose to Dolphins". The News-Herald. Retrieved December 10, 2018. ^ "Mitch Trubisky after Bears fall 1 yard short of Patriots: 'Close doesn't cut it'". Chicago Sun-Times. Retrieved December 10, 2018. ^ "Watch: Mitchell Trubisky covers more than 70 yards on 8-yard TD run". ESPN. October 21, 2018. Retrieved October 22, 2018. ^ Neveau, James. "Bears Beat Jets, Snapping Losing Streak". NBC Chicago. Retrieved December 10, 2018. ^ "Chicago Bears rout turnover-prone Buffalo Bills 41-9". USA TODAY. Retrieved December 10, 2018. ^ "Trubisky throws for 355 yards, Bears beat Lions 34-22". The Rock River Times. Retrieved December 10, 2018. ^ "5 observations from rewatching Bears-Vikings: Mitch Trubisky protecting himself as a runner, Akiem Hicks' best game and more". Chicago Tribune. November 20, 2018. Retrieved December 8, 2018. ^ "Chase Daniel slated to start at QB for Bears vs. Lions". NFL.com. November 21, 2018. Retrieved December 8, 2018. ^ "Bears' defense makes Mitch Trubisky's rough night immaterial in big win". Chicago Sun-Times. Retrieved December 10, 2018. ^ "Bears vs. Packers 2018: Final score and game highlights". Chicago Sun-Times. Retrieved December 16, 2018. ^ "There was a champion in town Sunday, and it wasn't the Packers". Chicago Sun-Times. Retrieved December 16, 2018. ^ Neveau, James (December 23, 2018). "Mitchell Trubisky Makes History in Bears Win Over 49ers". WMAQ-TV. Retrieved December 23, 2018. ^ Eurich, Matt (December 23, 2018). "Mitch Trubisky became 6th Bears QB to throw for over 3,000 yards". 247Sports.com. ^ "Bears believe Mitchell Trubisky ready for postseason". ESPN.com. January 2, 2019. Retrieved January 22, 2019. ^ Mayer, Larry (February 4, 2019). "Bears 2018 position review: Quarterback". Chicago Bears. Retrieved February 11, 2019. ^ "Pro Football Focus: Mitchell Trubisky". profootballfocus.com. Retrieved March 31, 2019. ^ Jahns, Adam (January 7, 2019). "Bears QB Mitch Trubisky's first playoff game should be remembered as a good one". Chicago Sun-Times. Retrieved January 7, 2019. ^ "Eagles vs. Bears - Play-By-Play". ESPN. Retrieved January 5, 2019. ^ Dickerson, Jeff (January 7, 2019). "Matt Nagy: Bears 'lucky' to have Mitchell Trubisky". ESPN. Retrieved January 7, 2019. ^ Eurich, Matt (December 18, 2018). "Seven Chicago Bears named alternates to 2019 Pro Bowl". 247Sports.com. Retrieved December 19, 2018. ^ Maya, Adam (January 21, 2019). "Mitchell Tubisky, Deshaun Watson added to Pro Bowl". NFL.com. Retrieved January 21, 2019. ^ Campbell, Rich (January 21, 2019). "Mitch Trubisky replaces Rams' Jared Goff to become 1st Bears quarterback in Pro Bowl since 1986". Chicago Tribune. Retrieved January 21, 2019. 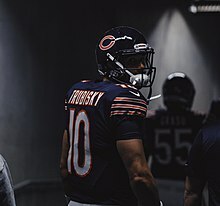 Wikimedia Commons has media related to Mitchell Trubisky. This page was last edited on 25 April 2019, at 12:40 (UTC).